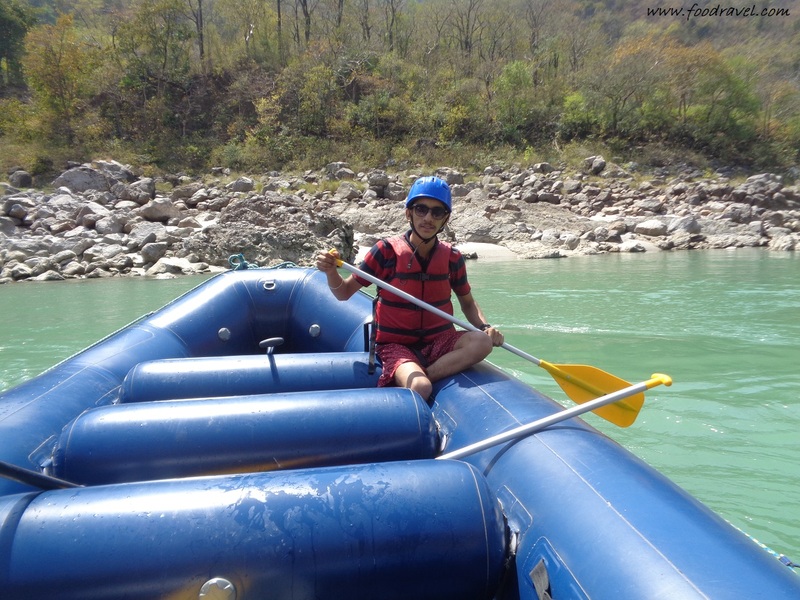 When we reached the rafting point, we came to know that we got our personal raft. We four and two guides, and that’s it. We were extremely happy. And that was our gift of waiting so long otherwise; at least eight people sit in one raft but got for our own. That was the best for us. 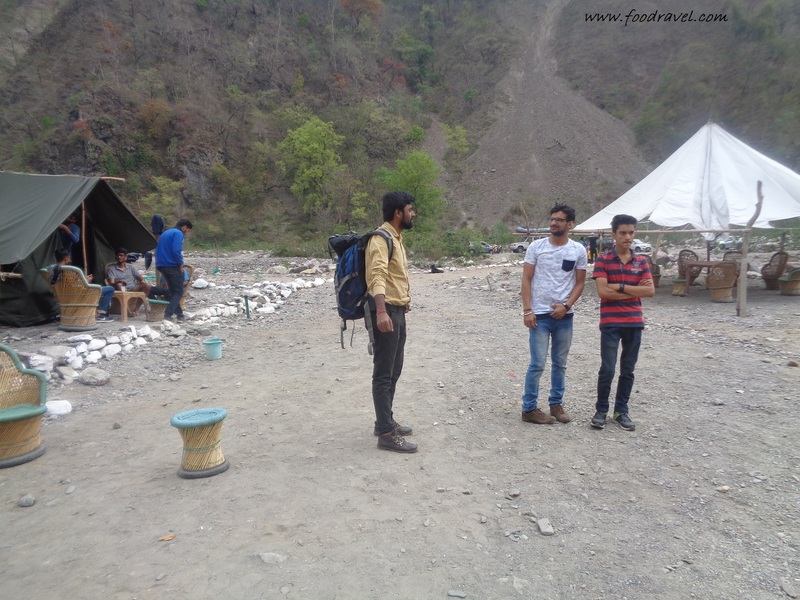 Once we reached the rafting point from where we would start our rafting journey, we got two guides, Shivam and Krishan. 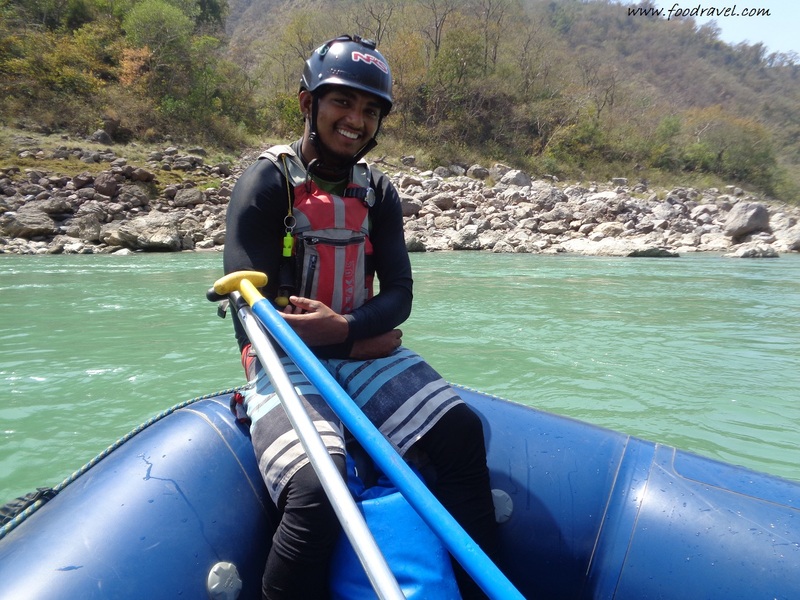 Shivam told us all do’s and don’ts of river rafting. 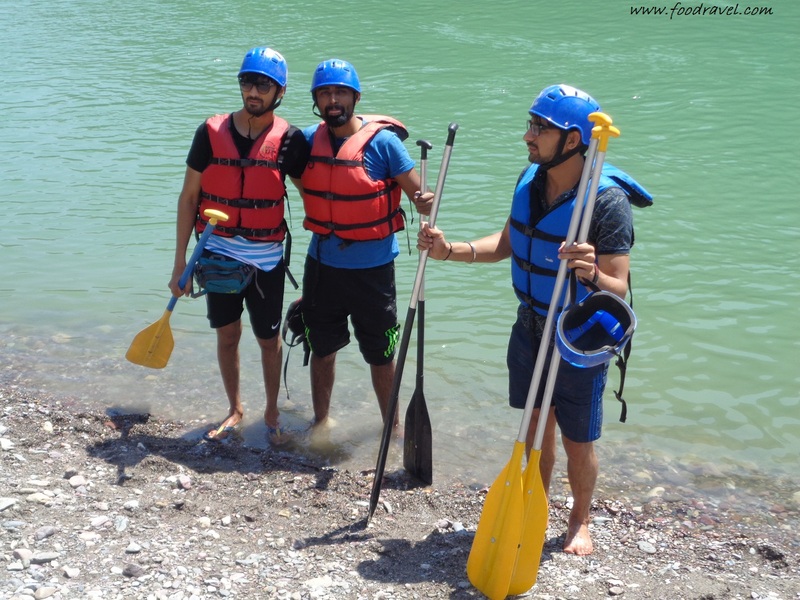 He told us how to row raft, what to do on any accident, how to save others etc. 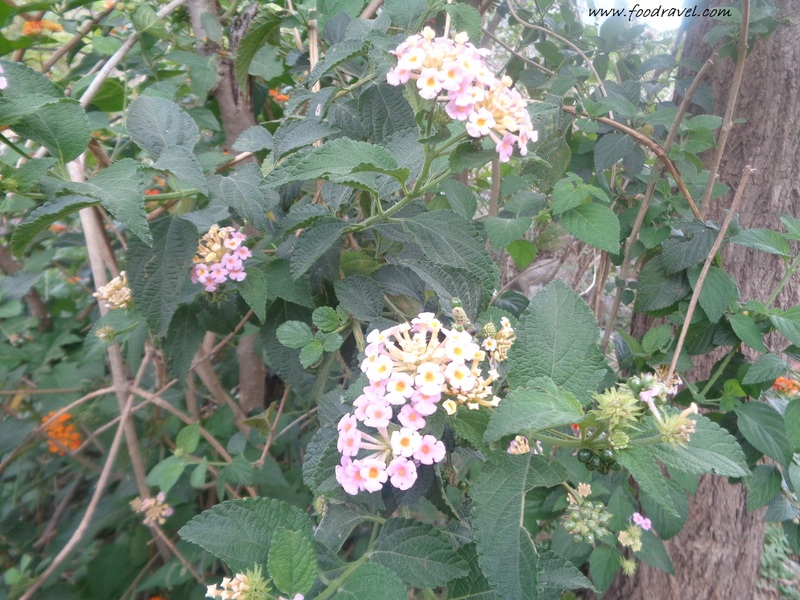 We paid attention to all things carefully. Finally the moment came when we touched the ground. 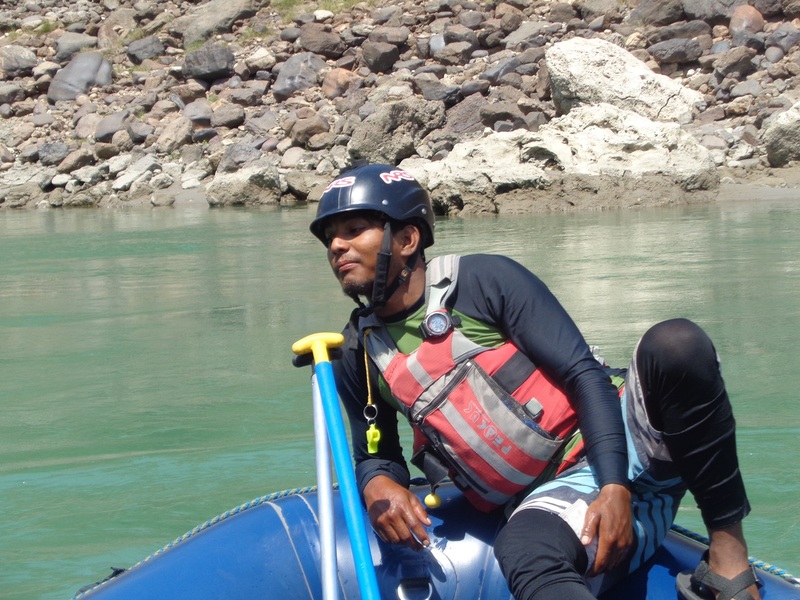 Rishikesh river rafting was going to thrill me endlessly. 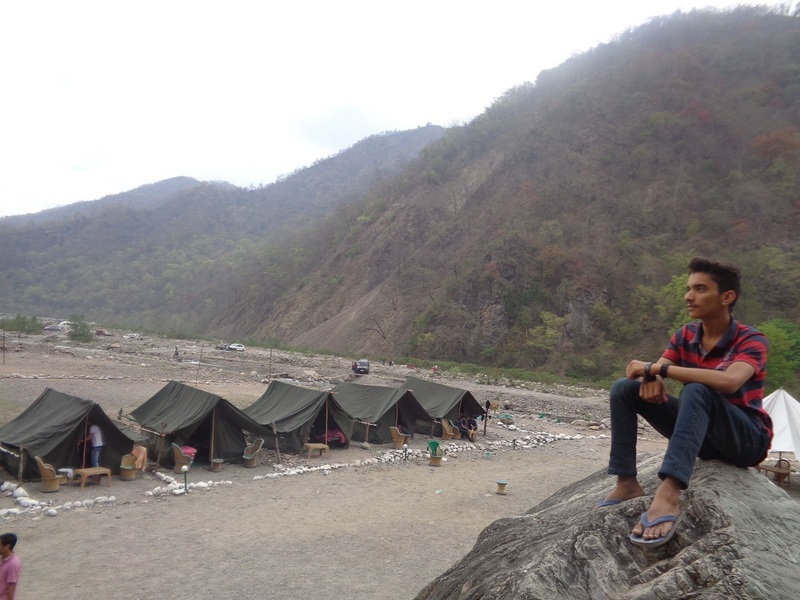 Travelling to Rishikesh wasn’t too less thrilling. Before this, I have never been to such place. It was my first time experience. We were all equipped up. We got our helmet and life jackets. We held our paddles and sat on the raft. 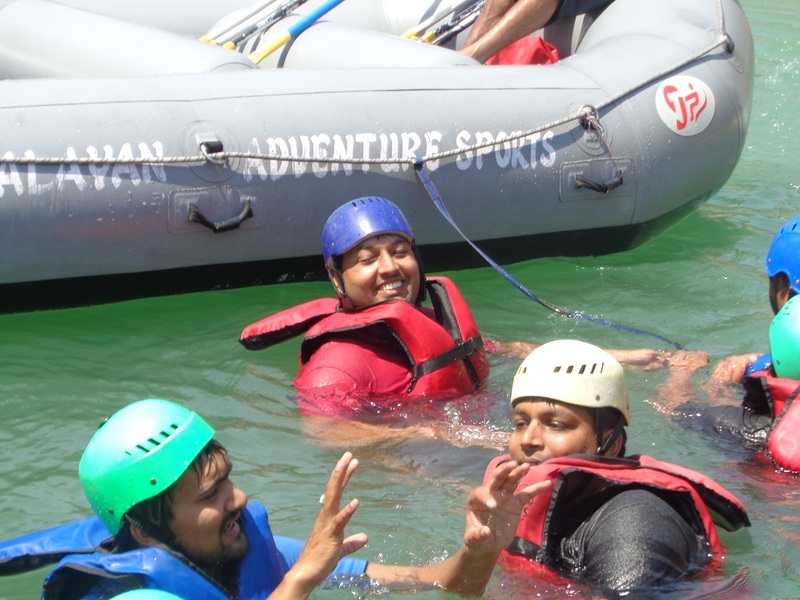 Shivam told me how to sit and how to get into water. He also told us how to get into raft back again from water. 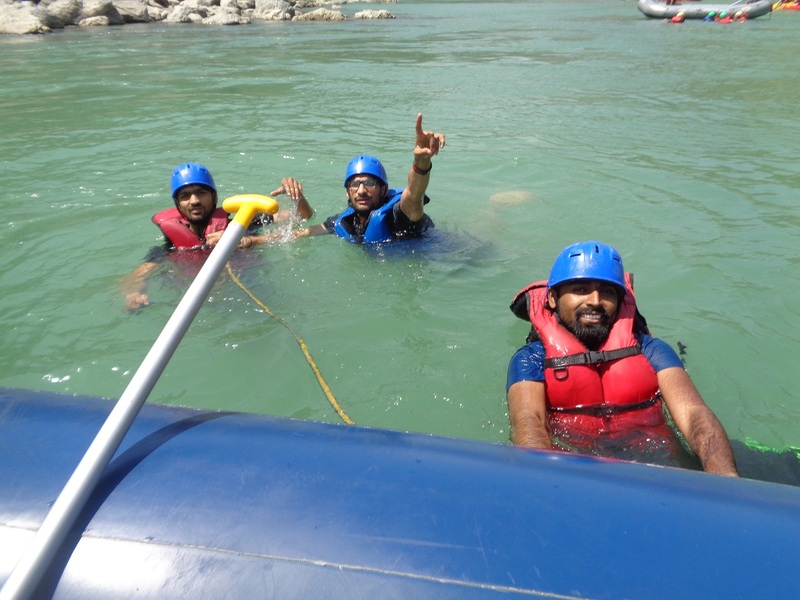 We started our river rafting journey from Shivpuri, Rishikesh. We started to row our raft with paddles. I may not be able to do justice by mere words with the experience I had when I did my first paddle into the water. The clear, calm water was so thrilling that it gave me goose bumps. 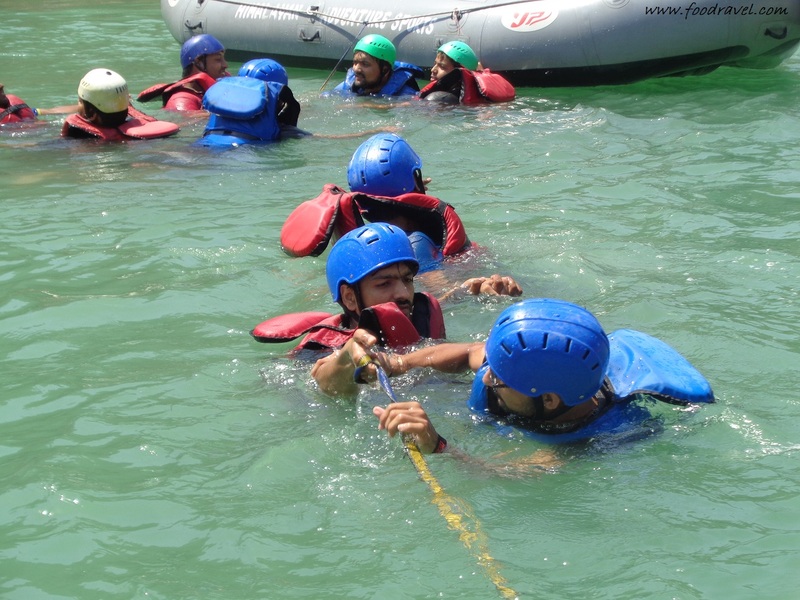 We all together started to row our raft ahead. Shivam told me how to row and he gave us some commands like forward, get in, deep forward etc. And we were to row according to his command. 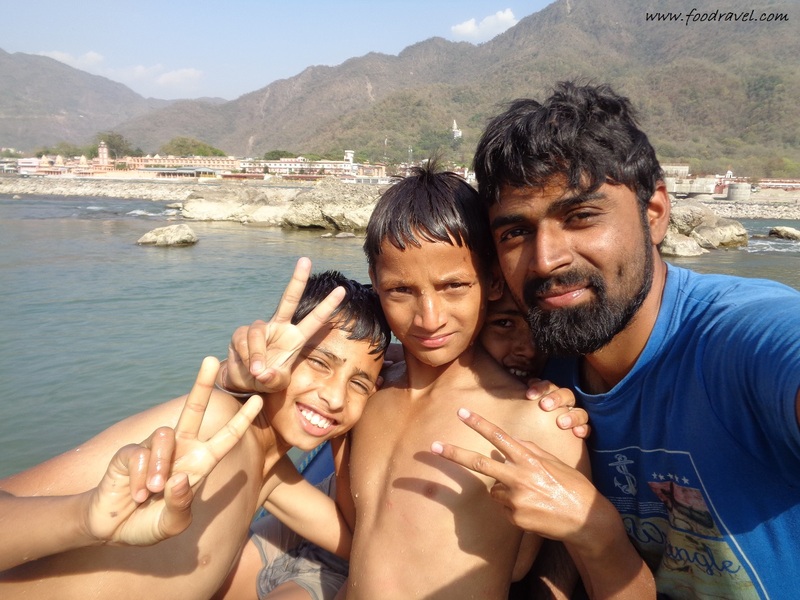 Our trip to Rishikesh River Rafting was coming to some amazing beginning. 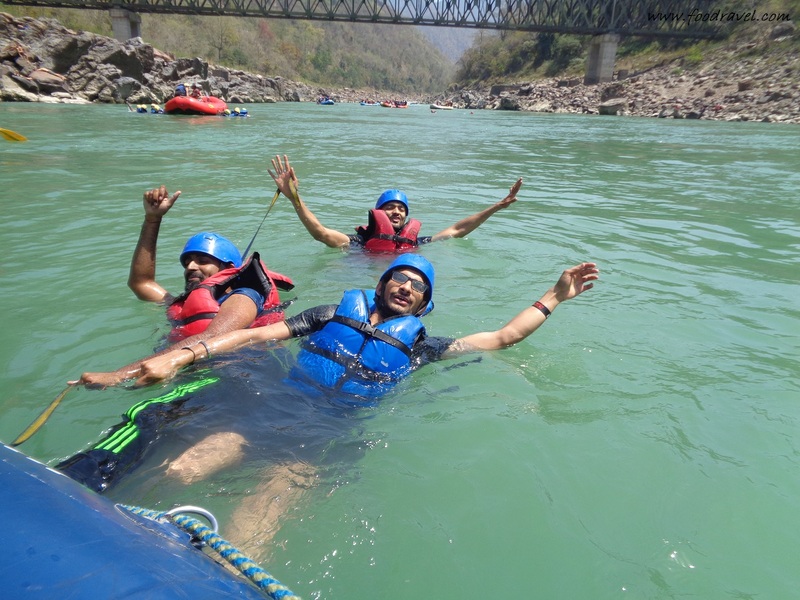 Finally, from here our white water rafting in Rishikesh started. 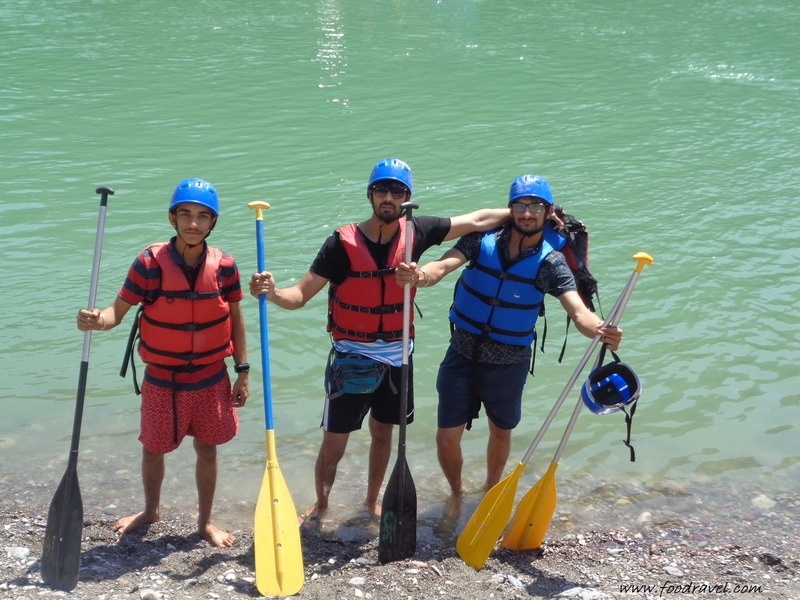 With every paddle I rowed, I was getting filled with great enthusiasm and endless happiness. We were shouting, hooting, competing with other rafts. We were moving ahead, leaving others behind. 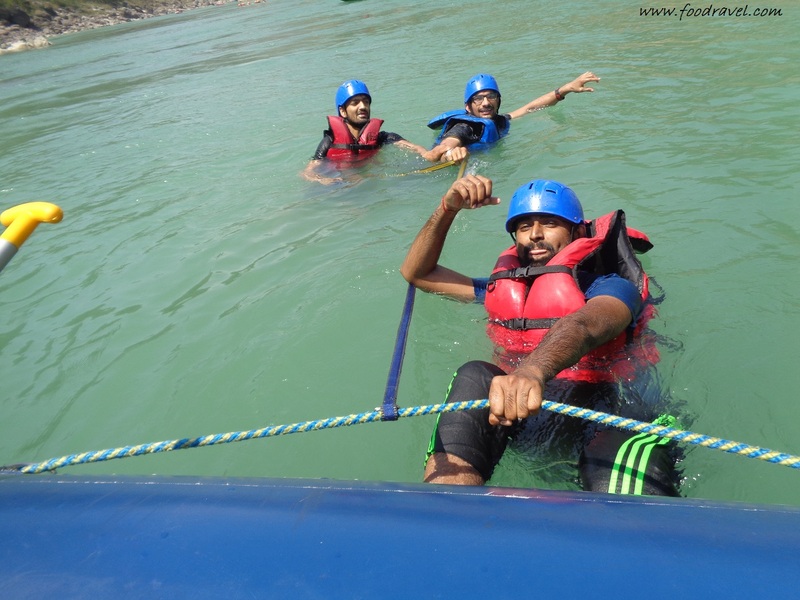 The adrenaline rush in my body was to its peak which gave me immense pleasure. 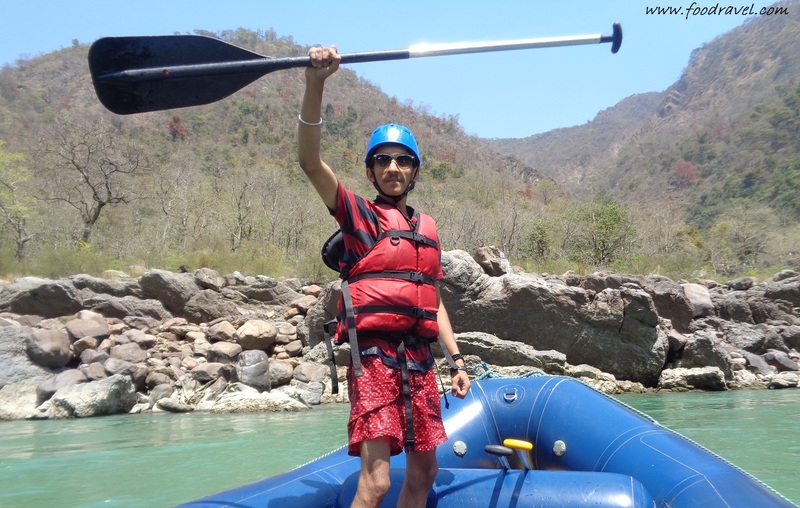 River rafting in Rishikesh is really a novel experience. 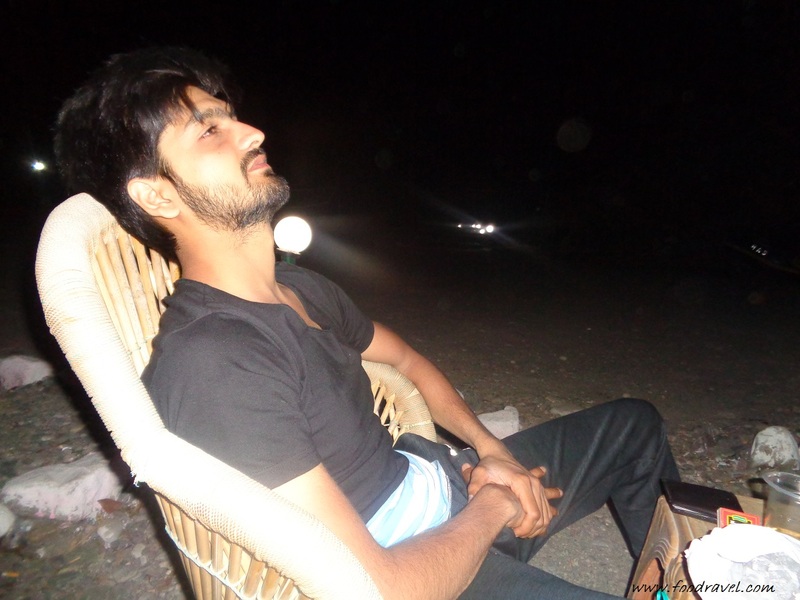 And we were enjoying it to its fullest at that moment. 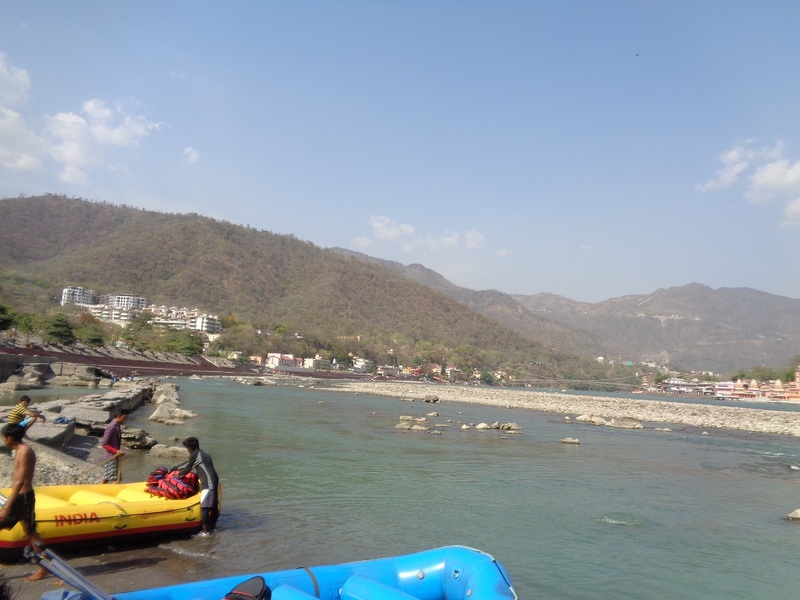 Rishikesh River Rafting has distance of almost 16KM from Shivpuri to Laxman Jhula, but we moved ahead of it and reaching to few more kilometres far from it. Ours must have hit at least 18KM or may be more than this. 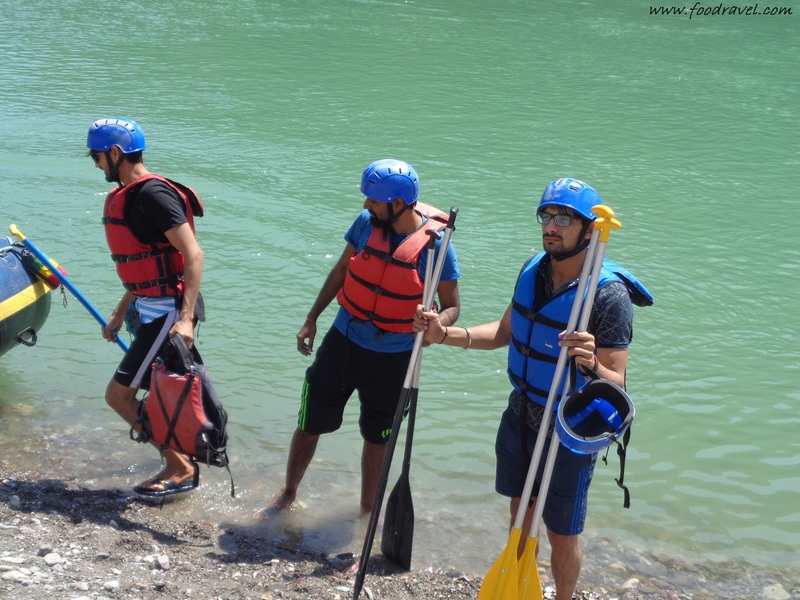 We crossed around 13 small and giant water rapids in Rishikesh River Rafting. 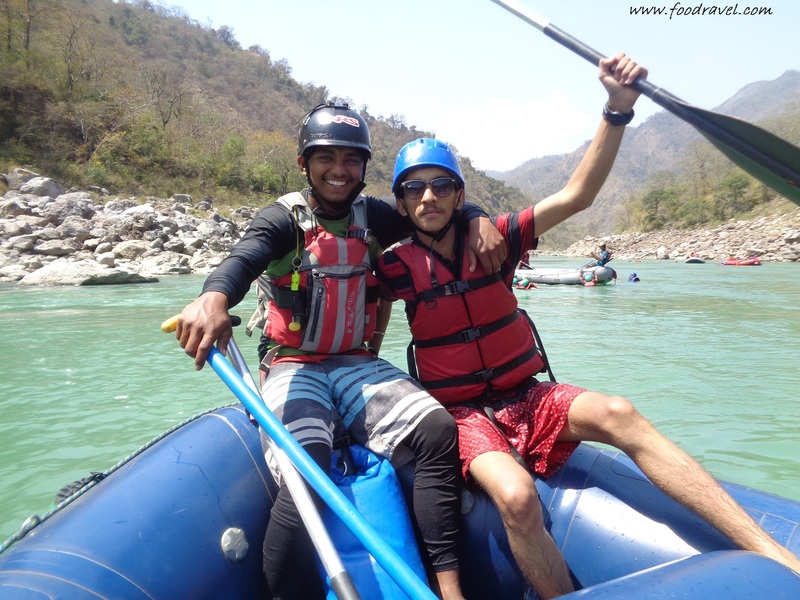 Passing through the rapids was truly among the best experience of Rishikesh River Rafting, I can say. 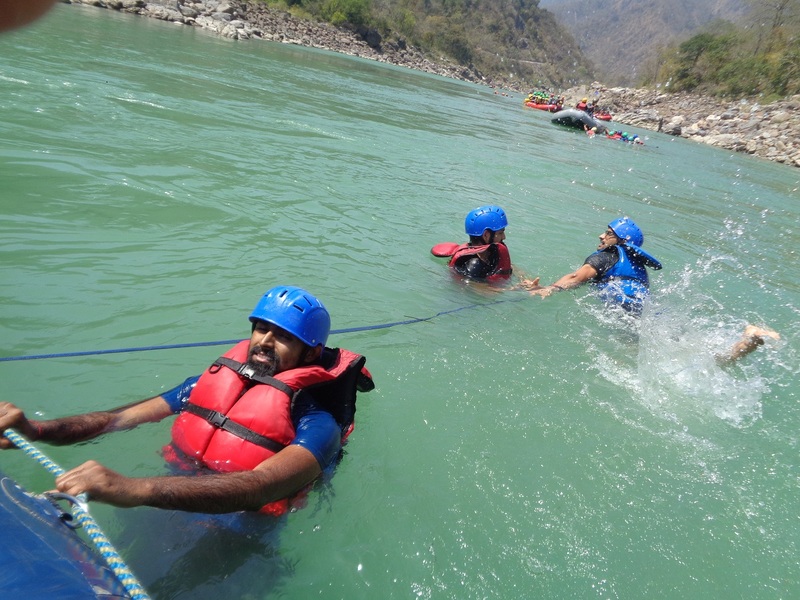 Some of the famous rapids in Rishikesh River Rafting were Cross Fire, Roller Coaster, Golf Course, Club House, Double Trouble etc. 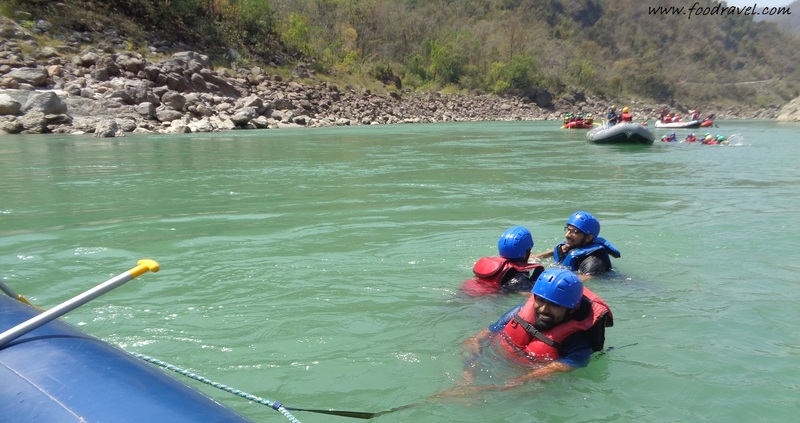 Rapids were the real attractions and the most amazing. 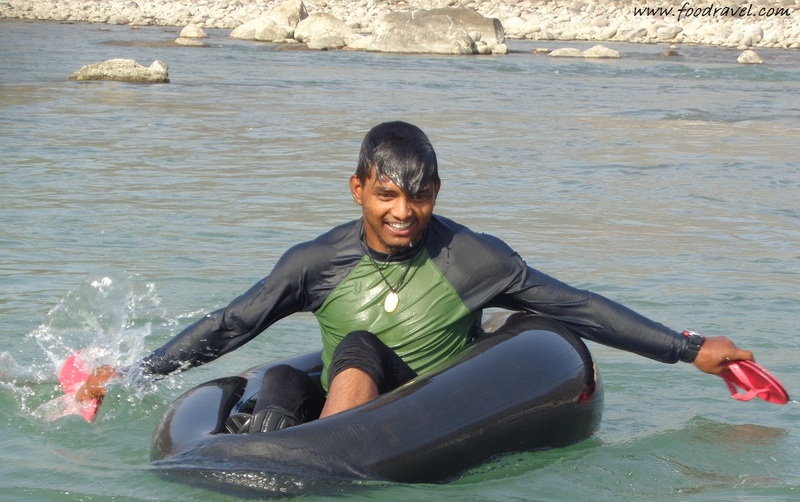 The water movement in the rapids is very violent and one may even fell down from raft. 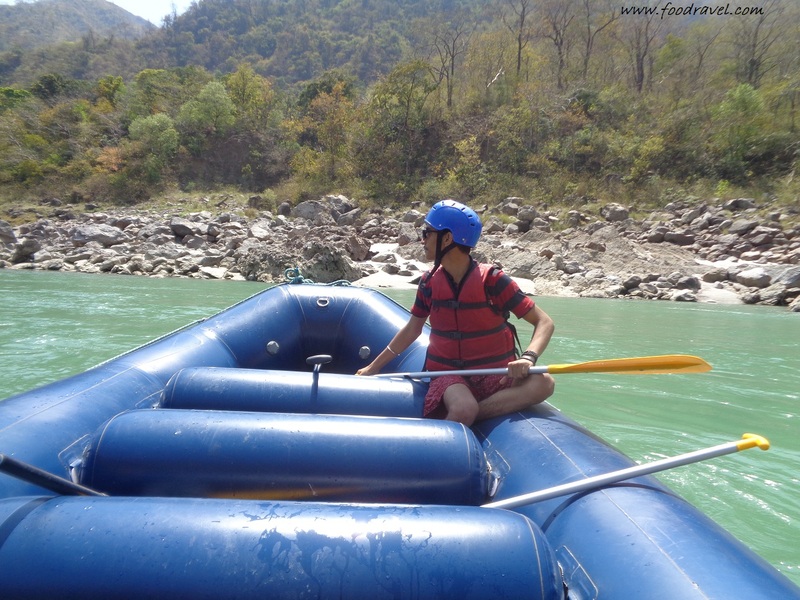 The moment you reach into the rapid area, the raft will be taken by them and the water will throw it up and down. 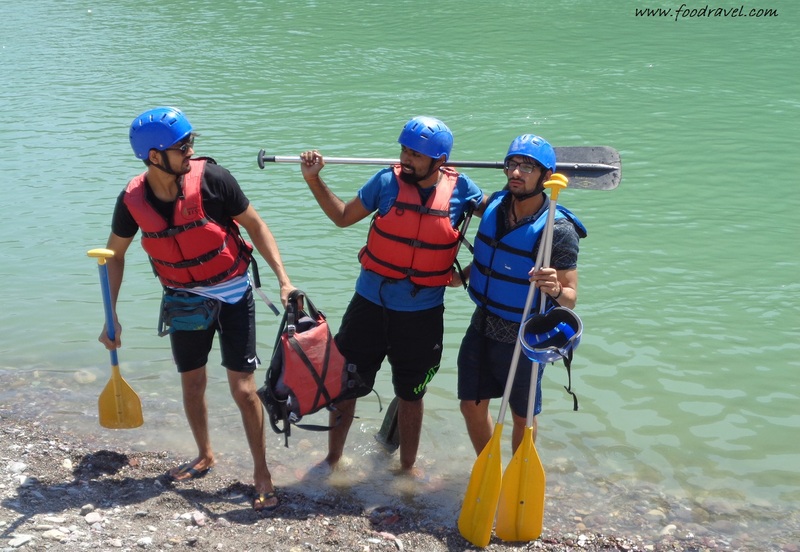 During this, you may even experience your raft going up to height in some feet and then falling down back to the surface. 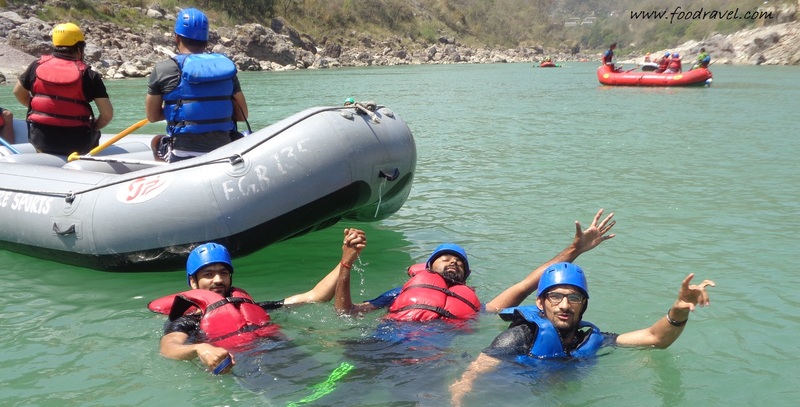 This was the real experience of Rishikesh River Rafting. On the way, there was a Maggie Point where everyone stopped and relaxed for around half an hour. 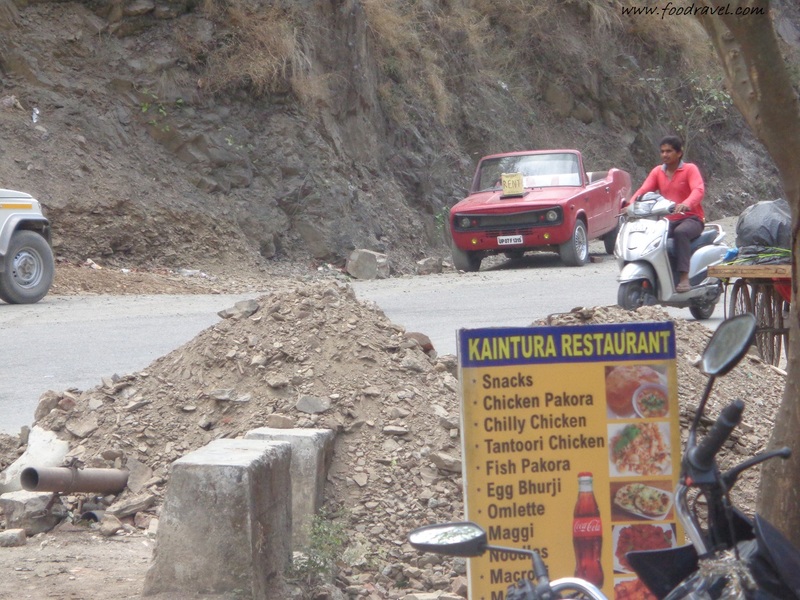 Everyone stopped there and climbed a small height where there was small shop of Maggie and other snacks. Next to it was cliff jumping point. There was a cliff and people were jumping from it into the water. Everyone from small kid to boy girls was jumping off the water into the cliff. 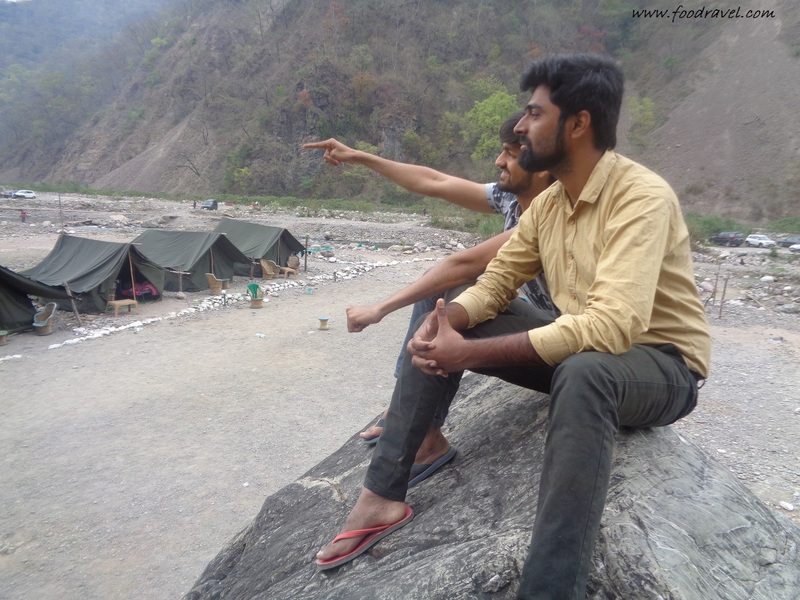 Rohan, Tanuj and Bhupender too jumped. It was me who couldn’t jump. Yes, I couldn’t, I tried twice but I couldn’t. And later on everyone started to make fun of this. After getting refreshed, we started our journey back and moved into the water. 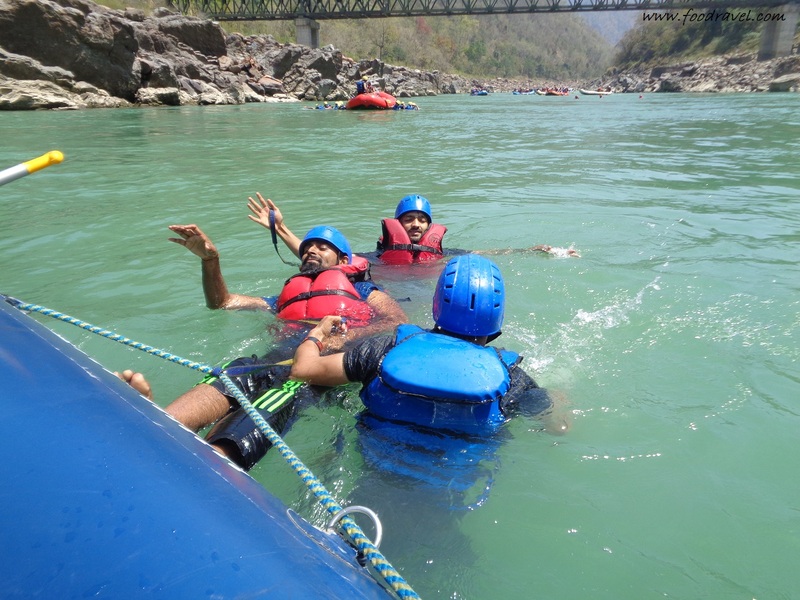 We jumped into the water, holding a rope attached to the raft. 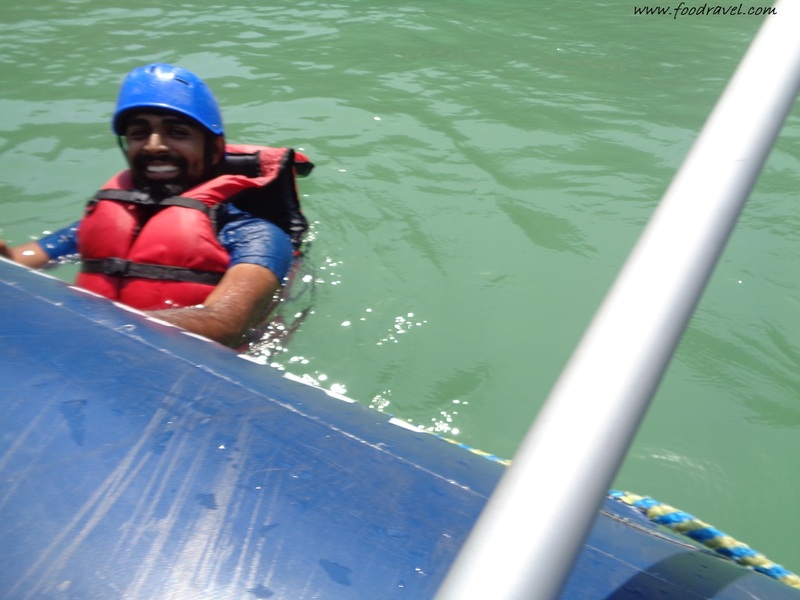 I really enjoyed swimming into the water (I don’t know swimming but the life jacket was playing its role). We spent long time in the water. It was cold but we enjoyed. 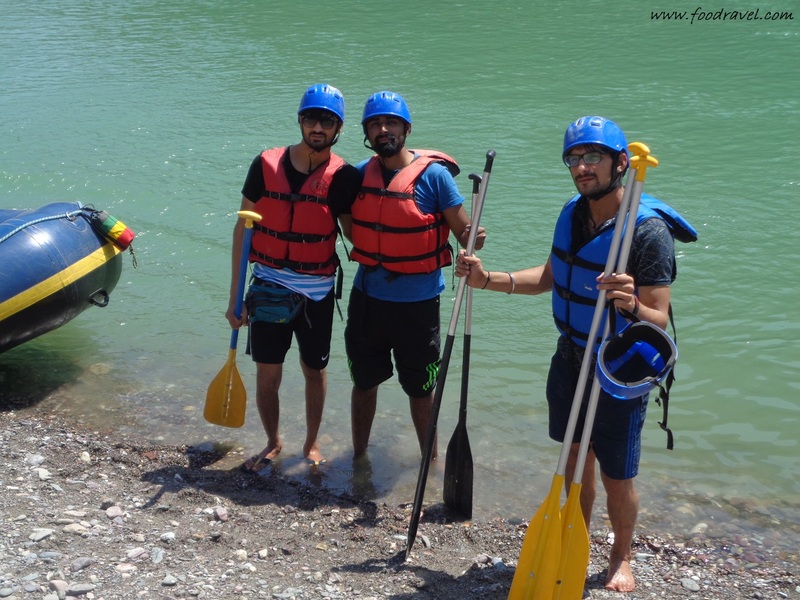 After hours of river rafting, our river rafting journey came to its end. We left everyone behind and came far ahead. From there we were taken to the campsite in the cab. We reached our campsite at around 4:30PM. We were literally hungry. But there was no food in the kitchen. The only thing we got was bread, pickle and tea. We were told that we would be served some light snacks at 7PM. We were all tired and hungry but we had no other option. So we waited till the time. At around 7PM, we were served snacks, pakodas. And we ate a lot as we were hungry. It started to get darker. We brought our Bluetooth speaker with us and played song it. It started to get darker and darker and we were told that the dinner would be served at 10PM. Till than we enjoyed snacks, cold drink and music. The dinner time came and we were offered dinner which included chapati, paneer veg, kheer and salad. After dinner, we kept on sitting for long. 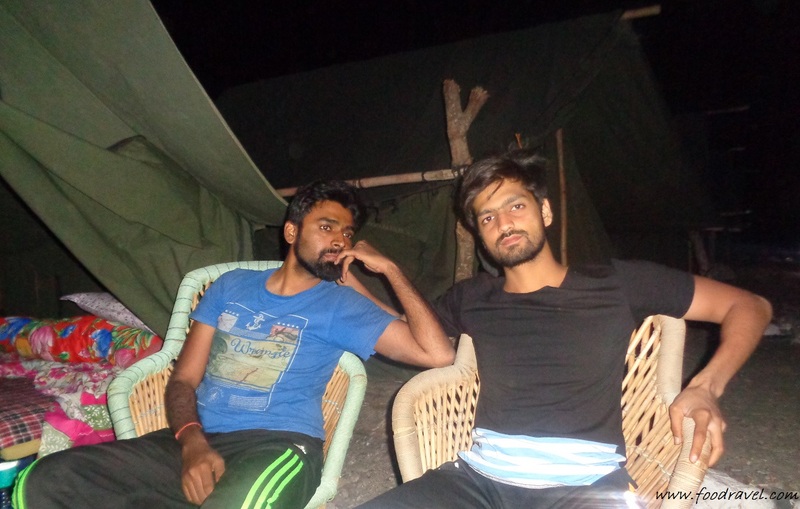 We talked with other people in camps. Music was always on. At midnight, we went to the water side and danced there. One guy played music in his car and all danced. We were already tired of long river rafting, and after dancing, we got more tired. 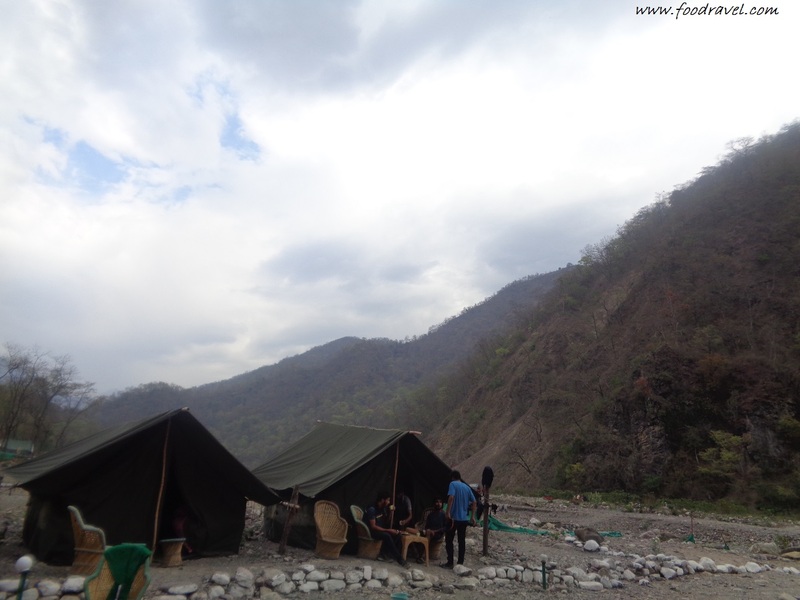 We went inside our camp and slept. We got up in the morning at around 7. We just washed our face and head in the water and got ready to leave. 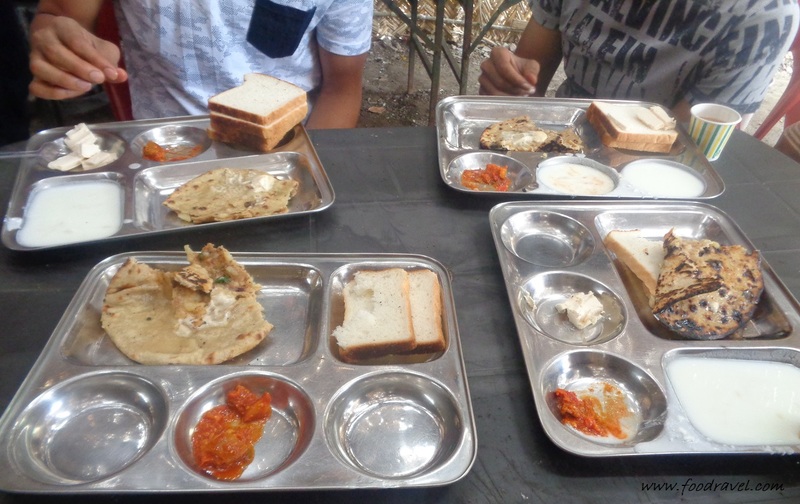 We had breakfast, aloo parantha and curd with pickle. We packed our bag and came out. 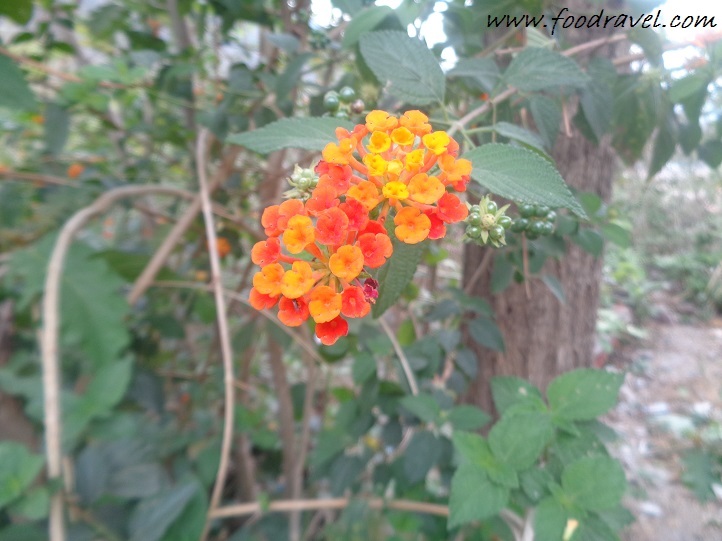 We got some snaps clicked. I wanted a group photo and asked someone to do it. He did four shot and all of them were waste. We left from there and came out on the main road. 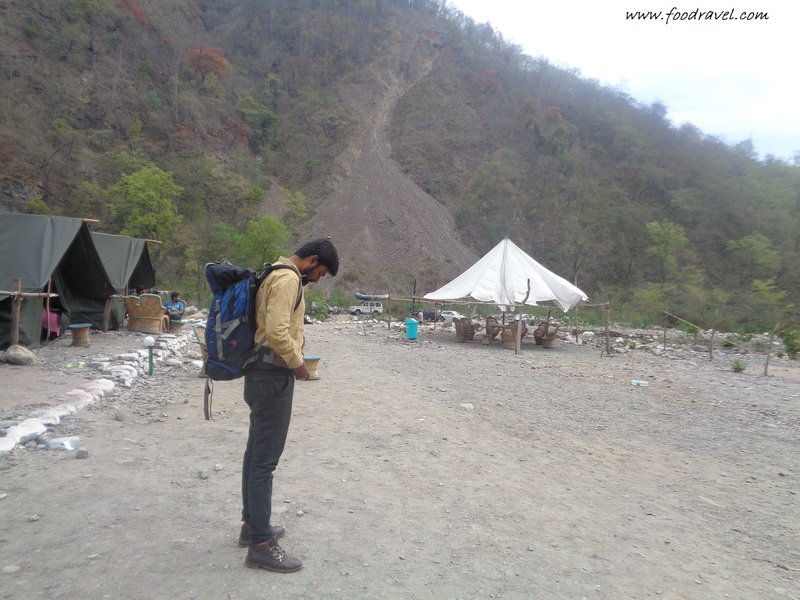 From there, we took a bus to Rishikesh bus stand. And from there we got a bus to ISBT Kashmiri Gate. We reached Delhi at around 6PM.